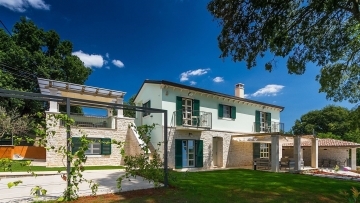 Beautiful villa with sea views near Poreč. The villa is a project that will be built 2016. The house consists on the ground floor of living room with kitchen and dining room, guest bathroom, bedroom with bathroom, storage room and a covered terrace. Upstairs are two bedrooms and two bathrooms and a covered terrace with a beautiful view of the sea and nature.